The LG SK10Y is a big but stylish soundbar that delivers an equally big soundstage with Dolby Atmos, but suffers from being rather front-heavy. However, there’s the option of wireless rear speakers for those seeking greater immersion, and the Meridian technology is a nice addition. The price is competitive, but the lack of DTS:X support puts the SK10Y at a disadvantage. 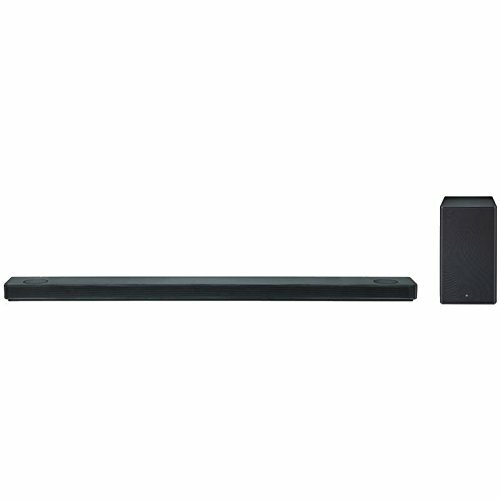 The LG SK10Y is the company's flagship soundbar for 2018. Not only does it boast support for Dolby Atmos, but it's the first product to benefit from LG's partnership with Meridian Audio. As a result, this soundbar's sonic performance is focused as much on music as it is on TV and movies. It's a big soundbar, but the design is stylish, the build quality super, and the feature-set extensive. The SK10Y supports High-Resolution Audio, works with Google Assistant voice control, and has Chromecast built-in too. Does all that make it worth its £899 asking price? The LG SK10Y is easily one of the largest soundbars we've reviewed to date. Indeed, it's as wide as our 65-inch LG C8. But then this is the kind of screen size this particular soundbar is aimed at. However, despite its size, the SK10Y is very stylish and surprisingly sleek, dressed in black with brushed metal and a cloth grille. You'll need a fairly large surface on which to install the soundbar – but at only 63mm high, it can fit in front of most TVs without blocking the screen. You also need to keep the sideways- and upwards-firing drivers clear of obstructions, so the SK10Y can't be placed inside a cabinet (assuming you could find one large enough). If stand-based installation is an issue, LG includes brackets for wall mounting in the box. The LG SK10Y boasts a number of key features, but the most important are its 5.1.2 speaker configuration and ability to decode Dolby Atmos for surround sound. What is surprising is the lack of any support for DTS:X, which is sure to disappoint film fans with a lot of Blu-rays and 4K discs (there's no DTS-HD Master Audio support either). Another key feature is the inclusion of technology developed by Meridian Audio. This includes Meridian's advanced 'Bass and Space' and 'Height Elevation' technologies which are designed to create a more immersive listening experience from non-Atmos content. If you want to add surround speakers to the SK10Y to complement the included sub and main soundbar, LG offers the SPK8 wireless rear speaker kit for £170. This provides dedicated surrounds for the soundbar, expanding the system to 7.1.2 with an additional 70W for each of the rear channels (resulting in 690W in total). Interestingly the SK10Y works with Google Assistant, allowing you to control the soundbar with your voice when it is connected to a compatible Google Assistant speaker. There's also Chromecast built-in, allowing you to cast songs, podcasts and stations from Tidal, Spotify, YouTube and more. Which is handy. The LG SK10Y houses all its connections in a recessed area on the underside of the soundbar. There's a reasonable selection available, but considering the size and price it would be nice to see more HDMI inputs. As it is you get two, and an HDMI output that supports ARC (Audio Return Channel), while all the HDMI connections support 4K/60p, Wide Colour Gamut, High Dynamic Range (HDR10 and Dolby Vision), and HDCP 2.2. Along with the HDMI ports, you'll also find an optical digital audio input, a 3.5mm analogue input, an Ethernet port, and a USB port for firmware updates. In addition to physical connections there are also wireless options, with WiFi (2.4/5GHz) and Bluetooth 4.0 built-in. There are some basic controls on the soundbar itself, located at the top and towards the centre, which allow you to select input, change the volume, choose the WiFi function, and turn the power on and off. The included remote is rather small and fiddly, but has large buttons at the top for power, volume, function (input) and mute. There are also play/pause and skip controls, along with buttons for info, sound effects, speaker levels, AV sync, auto volume and auto power. As well as the controls on the soundbar itself and the provided remote, you can also use your TV remote to control the SK10Y when connected via HDMI ARC. In addition, you have the option of LG's WiFi Speaker app to setup and control your soundbar. The LG SK10Y is surprisingly easy to setup, especially if you use the WiFi speaker app – because then you can see all the options without having to scroll through the settings on the eight character LCD display at the front of the soundbar. The soundbar and sub should pair automatically, too. Connect any lossless sources directly to the soundbar using the two available HDMI inputs. All your other sources can be connected to your TV, with their audio sent to the soundbar via HDMI ARC. If your TV doesn't support ARC, you'll need to use the optical connection instead. You can connect the SK10Y to your home network using either an Ethernet cable, or a wireless connection. For the latter you'll need to use the WiFi Speaker app, but its quick and easy to follow. Using the remote or WiFi Speaker app, you can adjust the centre, overhead and subwoofer levels to create a balanced sound field. While the audio setup is simple, it borders on being too basic. We would like to see some form of room equalisation on a flagship soundbar like this. For audio signals apart from Dolby Atmos, you can apply various surround modes. These modes include Standard, Movie, Music, ASC (Adaptive Sound Control, which optimises the surround effect in real time), and Bass Blast (which boosts the lower frequencies). As soon as we started testing the LG SK10Y, we could tell it was capable of a soundstage as big as its physical dimensions. The combination of seven speakers in the soundbar and the wireless subwoofer results in a wall of sound at the front of the room. The frontal array delivers a precise sound field around the TV, with effects either side and dialogue clearly focused on the screen. The side-firing drivers add width, while the upward-firing drivers create the overhead channels, and the sub the lower frequencies. The SK10Y handles regular television extremely well, with a precise and detailed delivery that results in clear dialogue and, thanks to the soundbar's width, music with great stereo separation. There's a nice sense of width too; and depending on the sound mode you chose, you can add more height and boost the bass. However, it's the soundbar's abilities with Dolby Atmos that is of greatest interest, and here the LG really delivers. We used the SK10Y with an LG C8 TV, so we were able to send Netflix shows in Atmos back via ARC. This approach uses lossy Dolby Digital Plus to deliver Atmos, but the results were still impressive, with a huge soundstage. The system is capable of going very loud. We started with a scene in Iron Fist, where Danny Rand is practising his martial arts in a basement. The rumble of subway trains moving overhead, the sounds of Danny's breath reverberating around the room, the sub adding real impact. That sense of scale is equally applicable for the opening of Mad Max: Fury Road on 4K Blu-ray: the various sound effects and voices localise across the front with remarkable precision. However, the soundstage is extremely front-heavy. The side-firing drivers are supposed to use Acoustic Phase Matching to create the impression of surround sound, but this was never the case in our experience. Yes, there's greater width, but never a sense of sound emanating from behind. This was easy to confirm using test tones and the opening of Gravity, with its highly directional sound design. The involvement of Meridian can genuinely be heard when it comes to music, as the SK10Y is one of the best-sounding soundbars we've tested. There's no doubt that the super-sized chassis helps, because there's excellent stereo separation between the left and right speakers. The front three channels use a combination of a 40 x 100mm woofer and a 20mm aluminium dome tweeter, which results in an excellent mid-range and super top-end. The results are impressive, with the SK10Y effectively reproducing Nick Cave's gravelly vocals on Red Right Hand, while the sub hits the bass notes with precision. The higher frequencies are nicely represented, too, especially in Kate Bush's delivery on This Woman's Work. It's a really balanced, pleasurable sound. The LG SK10Y is an impressive soundbar that has clearly benefited from the company's partnership with Meridian Audio. The sound quality is excellent, with wonderful clarity, exceptional detail and plenty of bass. Whether you're catching up on your favourite TV show, watching a blockbuster movie or simply listening to music, this LG is sure to please. The performance with Dolby Atmos is also excellent, creating an expansive wall of sound at the front of the room. However, with the sound focused at the front, there's nothing coming from the rear and thus a limited sense of immersion. This can be mitigated by adding wireless rear speakers, but that will add to the cost and you still won't get rear height channels. It would be nice if there were additional HDMI inputs and a more sophisticated setup process, but the SK10Y's big weakness is a lack of DTS:X support, which is sure to disappoint many surround sound enthusiasts. Overall, however, the LG SK10Y is a stylish and well-made soundbar with enough features and performance to justify its price tag. This is the most obvious competitor to the SK10Y, offering a very similar size and level of build quality, as well as a 5.1.2 setup, with side and upwards-firing drivers and a wireless subwoofer. It's pricier, but crucially it supports both Dolby Atmos and DTS:X, thus giving it the edge over the LG.